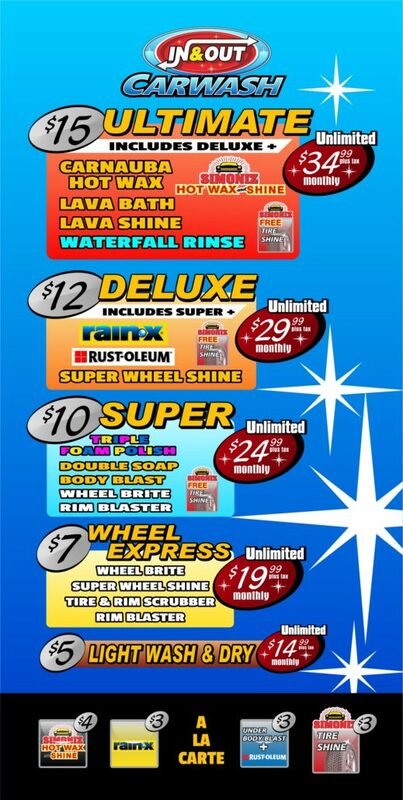 With our Unlimited Wash Club, there is no limit to the number of times you can wash your car each month at In & Out Car Wash. Wash every day if you want! As a member of our Unlimited Wash Club, simply drive up to the pay station at any In & Out Car Wash location and the gate will automatically open for you. Drive through to the conveyor entrance and our computer will automatically dispense the type of wash that corresponds with the Shine Car Washes program you purchased. 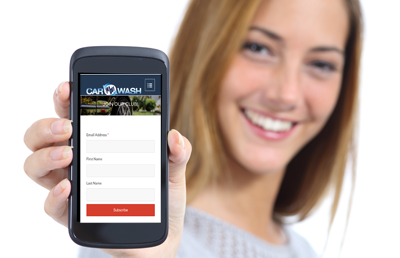 To enroll, any In & Out Car Wash location and our team can enroll you instantly, or you can Sign Up Online by clicking the “Sign Up” tab on this page. Sign up for the Unlimited Wash Club and we’ll debit your card monthly with the appropriate fee for the wash you chose. You can cancel your membership at any time by calling our office. View Terms and Conditions: http://www.inoutwash.com/unlimited-wash-club under Terms and Conditions tab. We will be in touch soon to finalize your order! How often can I wash my vehicle each month? Each membership is limited to one wash daily. Wash once a day or once a week…Whatever is most convenient for you. Does my Membership work at all In & Out locations? Yes. You can wash at any of our locations. You can cancel you membership at any time. We do require that you fill out and sign a contract stating you have read our terms of service and authorize your credit/debit card to be charged monthly. Does my credit card get charged monthly? Yes. Your card will be charged at the beginning of each month. Can I used one Membership for several cars? No. We can add multiple cars to one account, but each vehicle will be charged to that account monthly. There is a Link in this site to cancel or you can come into one of our locations and fill out a cancellation form. As an Unlimited Wash Club Member, you understand that your credit card will be automatically charged on the first day of each month until the Membership is cancelled. 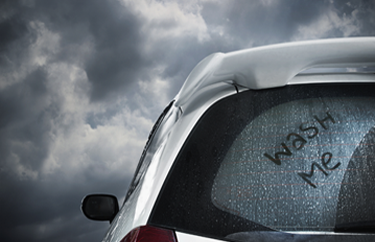 As an Unlimited Wash Club Member, you can wash your car up to one time per day every day of the month. Cancellations must be received at least 7 days prior to the next billing date, otherwise you may be charged for that month and the cancellation will not be effective until the following billing date. No refunds or credits will be given for partial periods. 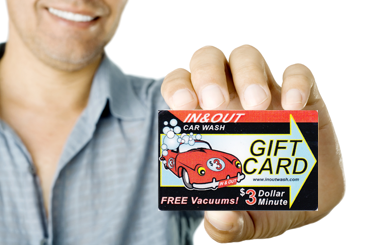 To cancel your membership, visit any In & Out Carwash location or visit or website inoutwash.com. Once cancelled you may use your membership for the remainder of the month. In the event In & Out Carwash is unable to charge your credit card due to expiration, change of information or other reasons, your membership will automatically be deactivated. Reactivation can only be done by stopping by any of our locations to update the needed information. Unlimited Wash Club RFID tags remain the exclusive property of In & Out Carwash and must be surrendered upon request. RFID tags are applied to the drivers side of the windshield and must be placed by an In & Out Carwash employee. Tampering with RFID tags will result in cancellation of Membership. Replacement RFID tags: Customer must notify In & Out Carwash if RFID sticker becomes damaged, is no longer visible, vehicle is sold, or windshield is replaced. A new RFID tag will be installed by an employee at no charge one time per Membership. All subsequent RFID tags will be replaced at a cost of $10. The Unlimited Wash Club is for private use. Taxis, Limos, app based professional transportation services (including but not limited to Uber and Lyft) are prohibited. The Membership cannot be combined with other offers, discounts, prepaid washes, gift cards, vouchers or coupons. In & Out Carwash will not increase rates without first notifying Unlimited Wash Members at least 30 days in advance of increase. Notice will be posted on our website inoutwash.com and emailed to all members with a current email on file. In & Out Carwash reserves the right to close stores due to in climate weather, holidays, equipment maintenance, failure or store upgrades.